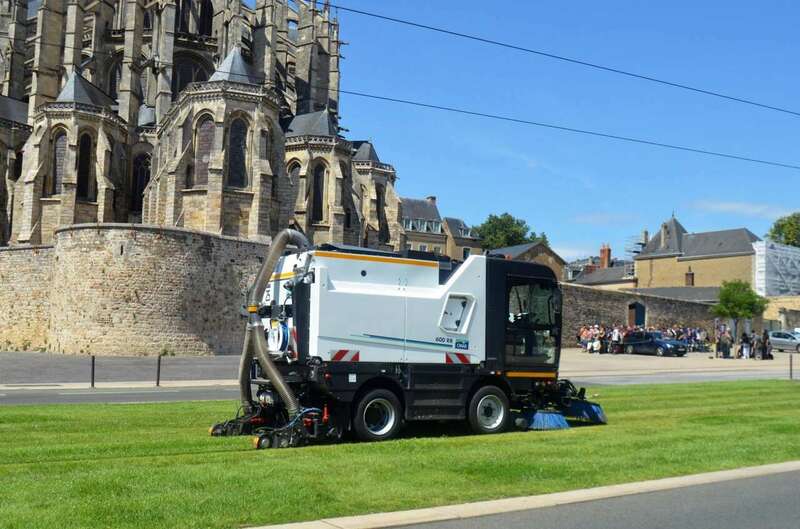 Its size gives the CMAR 600 RR compact sweeper a wide range of uses. It has very high suction power on a sweeping width of over 3 m. It is also used to clean the rail grooves and their surfaces using a high pressure spray and the brushing and suction of the waste. In this way, the machine guarantees the aesthetic appearance of the rails, but above all the driveability and braking capacities of the rolling stock, as well as its correct electricity supply. The power of the motor and the hydraulic system make it possible for the machine to fulfil its missions separately, without requiring an auxiliary motor while keeping it compact. Travelling speed: 25 km/h. This limited speed means that operators do not require a heavy goods vehicle driving licence and the vehicle does not require a registration number. 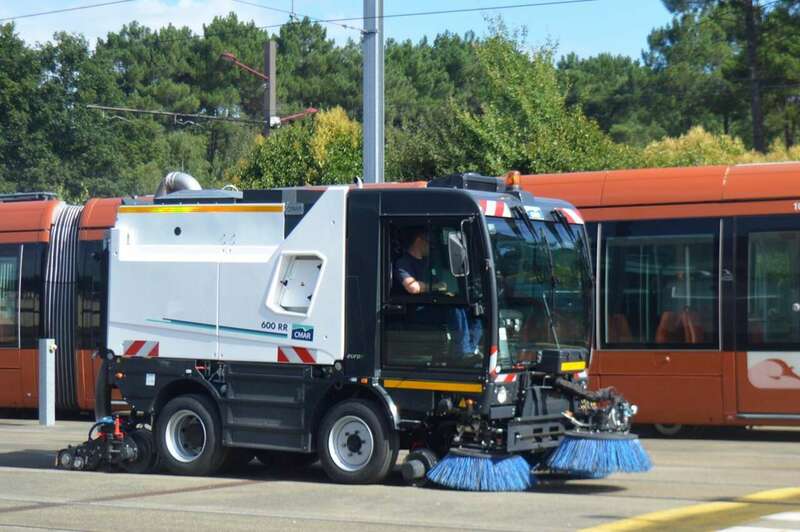 In sweeping mode, the speed is between 5 and 15 km/h depending on the quantity of waste to collect. In rail cleaning mode, the speed is between 5 and 10 km/h depending on how dirty the grooves and rail surfaces are. The machine is put on and taken off the rails in locations where the rails are embedded in a stable and load-bearing surface. It takes no more than a minute to put it on the rails and less than 30 seconds to take it off the rails, making it possible for the vehicle to work while passenger services are running. The minimum track curve radius is very short. 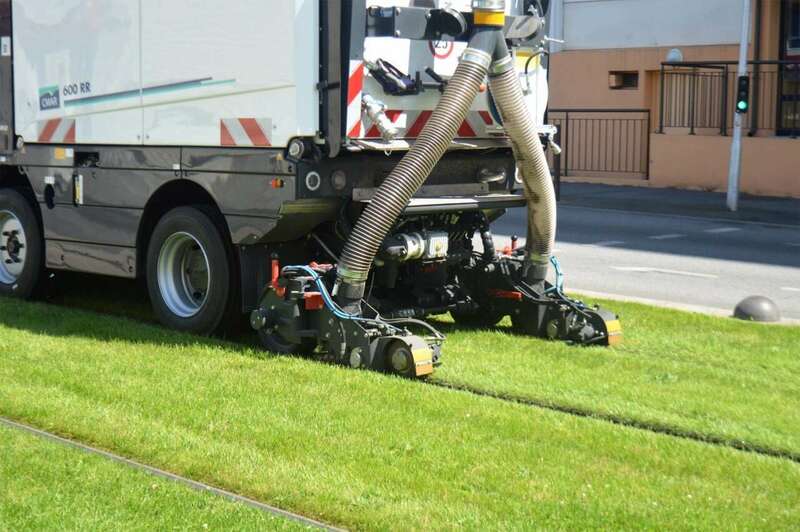 The vehicle can sweep grass zones without damaging them. The vehicle can move, work, brake and remain stationary on the steepest network slopes, whatever the rail condition except for ice and snow. The fully loaded vehicle (GVWR 12.100 t) launched on a flat surface on dry rails at a speed of 25 km/h stops in less than 10 m.
The vehicle provides its intended functions, outside preventive maintenance and services, without any other intervention than topping up fuel and lubrication. Suspended, pressurised and air conditioned. 2 plates with panoramic windscreen and ergonomic control console. Adjustable seat and steering column for added comfort. Remotely controlled emptying Manual suction pipe for piles of dead leaves, evacuation layers, etc. Guidance is provided by two guiding axles with two iron wheels. The guiding wheels have the same profile as the elastic wheels commonly used on trams, stop profile adapted to use on grooved rails. Each wheel is guided by two conical bearings mounted sealed, with external lubrication. CMAR has demonstrated its road-rail sweeping capabilities for many years. 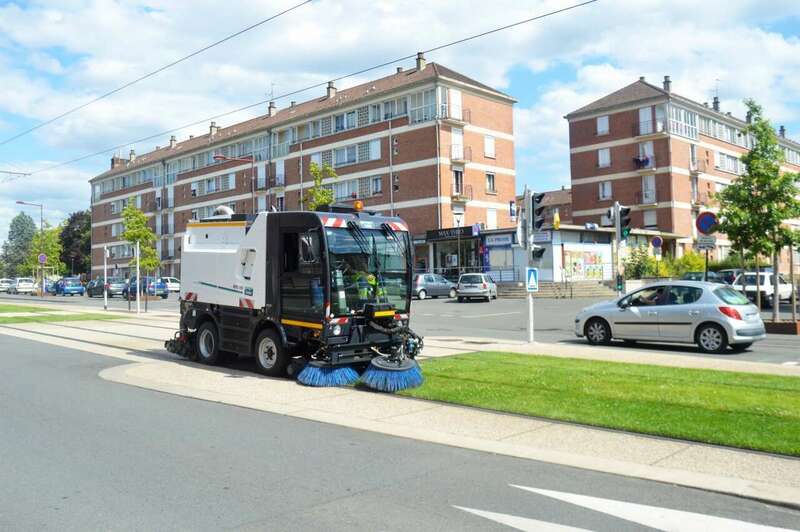 Many towns and cities in France and elsewhere have adopted the CMAR sweeping solution for their trams or metros. Choosing CMAR Is the guarantee of a reliable, effective product and a quick to react service.